Until recently I’d been using an old leather belt to secure (I use that word loosely) my gun holster. I didn’t really realize how badly I needed a proper duty belt until I got the chance to assemble a full rig made by High Speed Gear. Sure, my old leather belt worked, but anytime I wanted to attach anything to it I would have to remove it from my pants and feed it through my gear and holster. 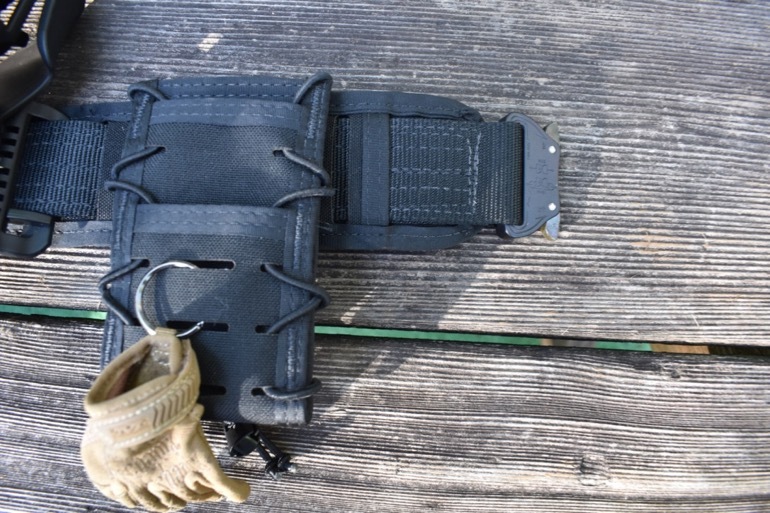 With High Speed Gear’s duty belt I can leave my gear, mag carriers and holster attached to the belt. When I need my gear all I have to do is clip the belt around my waist and I’m good to go. When building your belt on High Speed Gear’s website you can choose from several different buckles. My belt uses the excellent, proven COBRA buckle. The COBRA is extremely durable and secure and I appreciate the strength of an all-metal buckle. I have never had a plastic belt break, but I still opt for metal whenever possible. High Speed Gear is known for making great mag and gear pouches called TACOs. They’re available in many solid colors and just about every camo pattern you can think of for just the right tactical look. From handcuffs, pistol mags, rifle mags, sub gun mags or even 40mm grenades, you can get a High Speed Gear TACO in polymer or Nylon to carry just about anything you need to tote. Either way the sides are polymer with curved lips at the top that act as a funnel which makes inserting a mag easy. I set my belt up with TACOs for a rifle mag, two pistol mags, a flashlight and a tourniquet. The flashlight fits perfectly into a standard pistol mag TACO as does the tourniquet. The TACOs are easily adjustable for size and tension which makes for an extremely versatile system. Installing gear on the belt takes a bit of patience, though. You have to slide the belt through the loops on the belt pad. When you want to attach a piece of gear you then have to pull the belt up between the vertical straps on the belt pad, then through the gear then back into the belt pad. It’s not difficult, but if you decide to move a piece of gear, you have to backtrack, possibly through multiple pieces of gear. Getting all of your gear situated exactly how you want takes some time, but once it’s installed it’s going to stay put. The rubbery padding on the back of the belt provides and excellent grip, preventing the belt from traveling as you move around. When drawing a pistol or magazine the belt stays firmly in place. High Speed Gear makes a great cellphone TACO which will securely hold a phone even with a bulky OtterBox case. High Speed Gear proudly makes their impressive lineup in the US of A and all of their products are backed by a lifetime warranty. I’ve been using my belt regularly for a few months now and am throughly impressed. Everything is well made and thoroughly thought out. The next time I need a piece of gear and High Speed Gear makes it, I will look no further. Everything is made with first-rate materials and is assembled well. After lots of use of the past couple of months it all still looks like new. You can set up your High Speed rig almost any way imaginable. Setting up your rig takes some patience, but it’s worth it. I don’t mind a little work if it means my gear is secure and the way I want it. I can’t think of anything I would change. It just works. High Speed Gear makes a wide range of chest rigs that are compatible with many pouches and holsters. … I was told there would be tacos? I am waiting for them to release a Deadpool themed CHIMICHANGAS, that would be highspeed.